Driving meaningful and sustained change in government requires innovative, effective and efficient decision making and implementation for positive, significant and lasting results. 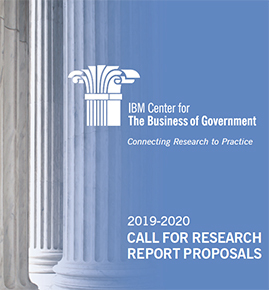 For more than two decades, the IBM Center for The Business of Government has supported leading researchers to address this imperative by identifying trends, new ideas and best practices—crafting approaches that support government leaders in addressing mission delivery and management challenges with strategies and actions that promote efficiency and effectiveness. Center reports assist public sector executives and managers in addressing real-world problems with practical ideas and original thinking to improve government performance. DIGITAL – Optimizing new technologies to focus on the user experience and incentivize innovators to modernize how government does business. These seven themes draw on significant insights shared by government, academic, and nonprofit leaders to identify key drivers for transforming government, and reinforced by the Center’s 2018 book Government For The Future: Reflection and Vision for Tomorrow’s Leaders. Through research into these areas, the Center will continue to help communicate what leading experts know about effective practices and lessons learned to government leaders and stakeholders. We again look forward to receiving proposals that address these imperatives, and continuing to work with the world’s leading public management researchers. Our next deadlines are April 1, 2019, November 1, 2019, and April 1, 2020.